Weaving - Where to Start? Welcome! If you're here, it's likely because you are curious about weaving, or you've just picked up one of my Weave & Go Kits! If you've followed along for the past few years you've likely seen me weaving up a storm. Once you start it's hard to stop! I am a huge advocate for incorporating art making + creativity into your daily routine. Weaving is SO therapeutic, it's relaxing, it teaches you patience, and it's just plain fun. Plus, it's an amazing way to use up any scrap yarns you've got laying around the house (any knitter's here?) OR it makes a fantastic excuse to treat yourself to some luxurious hand-dyed yarns (do I have a yarn problem? Yes). Ok, I've got your attention, you're interested! Now what? Below I'm going to answer a few of your questions and hopefully lead you in the right direction! 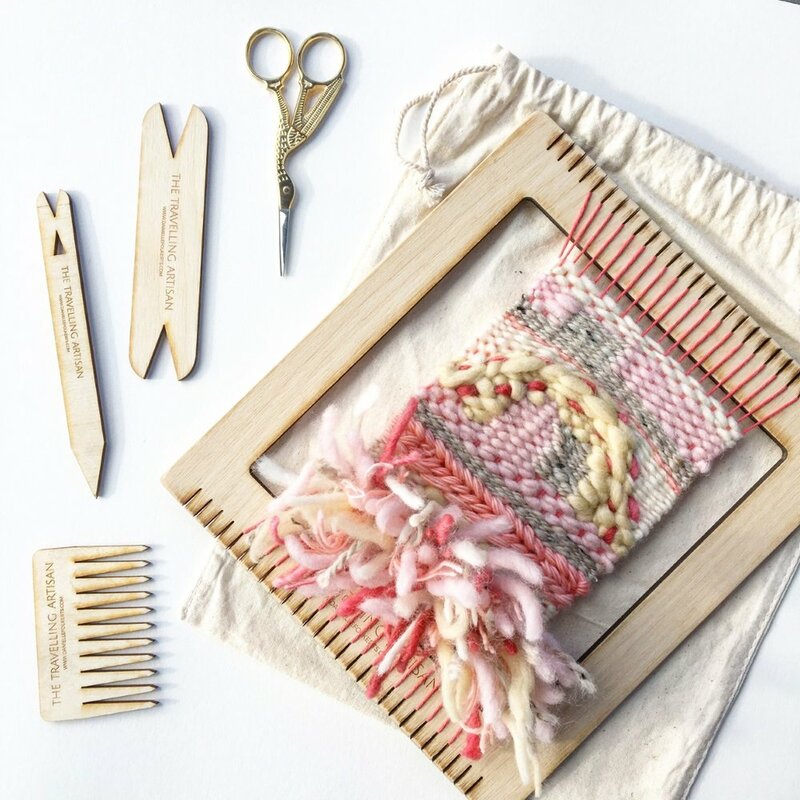 "What tools + materials do I need to start weaving?" LOOM - There is a variety of functional looms out there! From a simple DIY cardboard loom, to a portable lap loom, or an adjustable large scale frame loom. I recommend beginning with a functional lap loom, it's a great way to give weaving a try without breaking the bank! TAPESTRY NEEDLES - Weaving needles come in many lengths and widths, and can be made of plastic, wood, metal or acrylic. These are key! You'll use needles to guide your weaving yarn (weft) and create rows. COTTON WARP - Your warp thread needs to be strong and smooth. I usually use cotton thread, but you can use anything, as long as it can withstand constant tension and friction from beating down weft yarns. COMB - A comb helps you press down each weft row evenly as you go. SCISSORS - For snipping your yarn and cutting loose threads. SHUTTLE STICK - a shuttle is a tool that holds a long length of yarn while you weave. Shuttles are wrapped with yarn and slide between your warp thread. They are a more efficient than using a needle when you're weaving larger blocks of the same fibre. YARNS + FIBRES - This is where the real fun starts! Yarns come in countless colours, textures, materials and weights. You'll be able to choose between natural and synthetic fibres, creating any combination you desire. A few frequently using fibres are cotton, rayon, wool, silk or alpaca. What is the difference between WARP and WEFT? All woven projects are made up of warp and weft threads. Warp threads act as the vertical structure on a loom. You will string your warp thread around the notches of your loom, running up and down. Weft threads are fibres horizontally woven through the warp thread, alternating under and over, binding and creating your cloth. Typically you will use cotton thread for your warp, you want it to be tight with even pressure, and strong so it can withstand your weft. You can get as creative as you like when it comes to your woven fibres, from cotton, silk, wool roving, natural or synthetic yarns, fabrics, branches, you name it. What will your upcoming Weaving Workshop cover? I'm SO excited to announce my 2018 workshop dates SOON. My Beginner's Weaving Workshop will cover the basics! We'll talk about your ideas, how to execute your vision, choosing colour combinations, using different fibres, and how to warp your loom. In this workshop I will demonstrate how to do a basic tabby weave, bubbling, rya knots, soumak, creating basic shapes and how to finish off your piece. I'll also be sharing some fun bonus skills and techniques! The great news is you have complete freedom to create, surrounded by a small group of beginners like yourself, with valuable feedback, live demonstrations and hands on learning. All materials, yarns and snacks are provided, and if you already have my kit your get a 15% discount. What does your Weave & Go Kit include? This kit was designed for makers on the go. We have busy lives, and it's important to carve out time for art making. I've put together a comprehensive tool package for you to get started on your weaving journey. Kit's are laser cut in Kingston, Ontario. This starter kit is perfect for making small wall hangings, coasters, decorations, small cushions, you name it. It makes a great gift for yourself, or a friend! What does your kit include? - Baltic Birch Lap Loom 8.5"x9.5"
** Scissors and yarn not included in kits. How can I get notified about your workshops? Join my VIP newsletter! Get the details right into your inbox. My newsletter goes out once every season. Be the first to hear about new workshops, tutorials, artworks and events. OR Follow @TRAVELLINGARTISANWORKSHOPS on Instagram for all things WORKSHOPS! What if I want to learn on my own at home, or I'm not in Kingston? Everyone learns differently! Personally, my favourite way to learn is in a workshop... surprise surprise! I still sign up for workshops regularly. I love to see techniques in person so I can ask way too many questions and really understand what I'm doing. There is always more to learn and every art instructor brings something brand new to the table! If you would rather learn at home you can definitely find learning resources online, or pick up a weaving instruction book at your local library or bookstore. If you want free education you can always browse Youtube to get started here. If you want to attend a workshop but aren't nearby I encourage you to keep your eyes peeled for similar workshops in the your city through Etsy or Eventbrite. Take a visit to a local gallery, artist centre, or craft fair and see what your community is offering. What type of projects can I do with Weaving? Really the question should be what CAN'T you do! If wall hangings aren't your thing you can still do so much with weaving! From coasters, runners, chair covers, pillows, clutches, scarves and jewelry! The possiblities are endless. I want to hear from you! Have you tried weaving? Are you interested in a workshop? Do you have any other questions?Comment below! Tagged: the travelling artisan, danielle folkerts, tett centre, ygk, kingston ontario, lacombe alberta, weaving, how to weave, beginner's weaving workshop, what do i need to weave?